Good fats, bad fats… what is the difference? 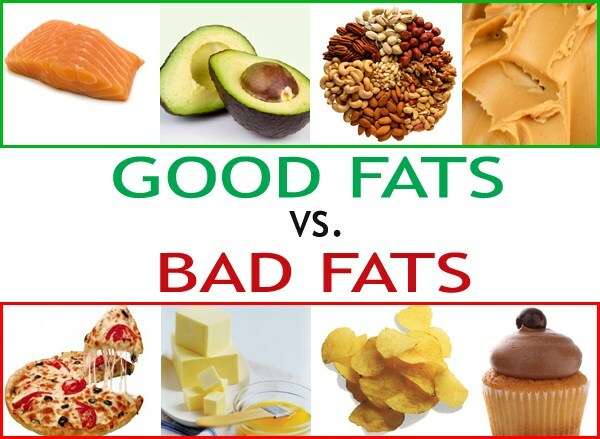 But there is a difference, there are good fats and bad fats to look for in your diet. Fat is the target of much scorn, yet it serves up health benefits you can’t live without. Fat supplies essential fatty acids (EFAs). Your body is incapable of producing EFAs, known as linoleic acid and alpha-linolenic acid, so it must come from your diet. In addition, fat carries vitamins A, D, E, and K, which are fat soluble vitamins, into and around the body. Fat is also necessary for maintaining healthy skins, and plays an important role in promoting proper eyesight and brain develop in babies and children. Although fat does good, it is usually the culprit in the battle of the bulge. And it is easy to understand since fat contains 9 calories per gram. Good fat or bad fat, it packs more than twice the calories per gram than carbohydrates and protein. Yet, it’s a mistake to equate dietary fay with body fat. You can get fat eating carbs and protein, even if you eat little dietary fat. Excess calories from any source is what is responsible for weight gain, not fat per se. If weight gain is your concern then watching your total calorie intake. There is an established link between fat intake and heart disease and stroke. Diets rich in saturated fat and trans fat, both “bad” fats, raise blood cholesterol concentrations, contributing to clogged arties that block the blood flow. When it comes to fat quantity and quality count. Make sure you read the labels on your food! If you are concerned about your weight or heart health, rather than avoiding fat in your diet, try replacing trans fats and saturated fats with good fats. This might mean replacing fried chicken with fresh fish, swapping some of the meat you eat with beans and legumes, or using olive oil rather than butter. That’s a wrap!!! I just completed my first full length video shoot!!! The title is Pilates Strong, there is a beginning and advanced version. I had a great team of people that I could not have done it without them. I know that having a good team and surrounding yourself with positive people is important, and the way everything came together the day of the shoot was proof how important having a good team is! I feel so blessed! Pilates Strong is a name I came up with, very similar to the popular “Boston Strong” and several other catch phrases that have been popping up. To me Pilates Strong means being strong from the inside out. In Pilates we focus on your core, or center, and other deep muscles to support your skeletal structure, which is one side to being Pilates Strong. Other side is the mental/ spiritual side. In Pilates every move is done by engaging the mind to focus on the muscles you are working in a particular exercise. Then there is breathing, which is an essential link between the mind and the body. Put that all together you have Pilates Strong. So the day began at 6:30am with hair and makeup at Flawless Faces in Costa Mesa. Carina did an amazing job and was super fast. She made everything so easy and she was very professional. I love her salon!! Then I was off to the shoot. I had two my friends in the video with me, Melanie and Jenny. Both beautiful and talented! We all were wearing beautiful Delano Wear! The clothes were amazing and added so much to the video! Check them out at www.delanowear.com. I also had the amazing and talented Cassie there to style the shoot, help me with my lines, and assist with all the details of the workout! I was nervous and it was great to have someone there that has done this before and knows the industry. She is seriously the best!! After everything was set up, it was ACTION time! And of course I had to play with the clapper! The hardest part was my part speaking in the beginning! I was nervous! But after a few takes….I got it!!! Then it was on to the workout! And I was in my element, I just taught as if I was teaching a normal class! We had a good time and we were tired at the end! We ran through the routine several times, everyone had to get their close ups with different camera angles. Then we were done with the beginning video! My workout models left because the advance video only had me in it. The advance video is a tough workout and by the end I was tired! But I still had to shoot my top 6 nutrition tips for the video! For this we went outside over looking the bay in Newport. It was a beautiful clear day. There was a few retakes of people walking by and random loud noises…but we did it!! I can’t wait to see the final product and share it with all of you!! This shows my love of Pilates and I hope you love it as much as I do!! And don’t worry…. there will be more videos in the future! !